One of the delights of being a member of a CSA is opening the weekly “basket” to find wonderful ingredients you had not expected…all as your mind races to figure out what to do with them. It is simultaneously a moment out of Food Network’s Chopped….and precisely its wonderful opposite. Rarely does a CSA basket contain an ingredient expressly designed to stump you. Prepare the Persian Cucumber Pickle. Cut the Persian Cucumber into thin, one inch batons. Place the cucumber batons in a non-reactive bowl, liberally sprinkle with salt and mix to make sure that the salt covers all surfaces of the cucumber. After 2 to 3 minutes, the cucumbers will give up a lot of water, which should be thoroughly drained. Put the remaining ingredients in the bowl and combine thoroughly. After about an hour the pickles should be ready. This will make more pickles than necessary for this dish but they will keep in the refrigerator for about a week. If you intend to keep them any longer they must be properly canned. Make the Dill Cream. Place all the ingredients for the Dill Cream in a small bowl. Whisk to thoroughly combine. Set aside the sauce until ready to use. Make the Salmon Tartare. Combine all of the Salmon Tartare ingredients in a bowl and, using your hands, gently mix to thoroughly combine. Refrigerate the Tartare for half an hour before using. Assemble the Dish. Arrange the leaves of Arugula attractively on a plate. 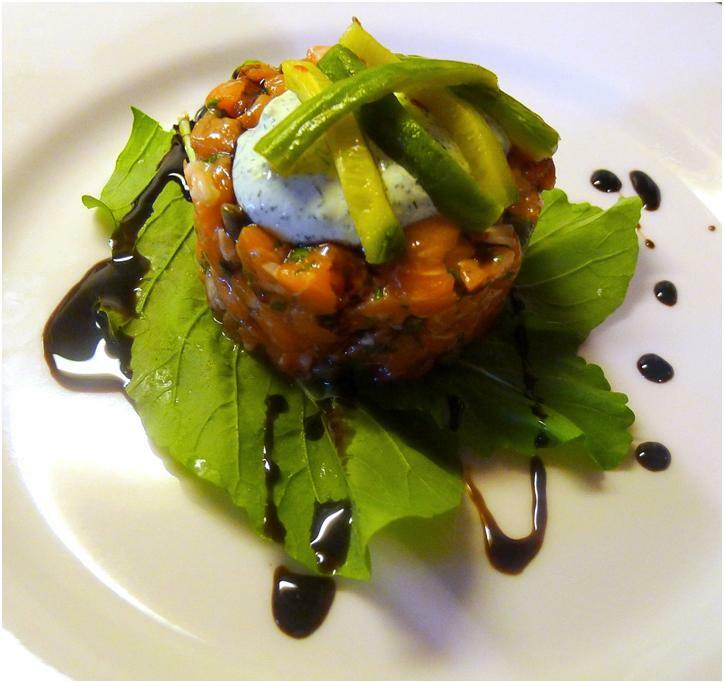 Spoon the Salmon Tartare into a ring mold on top of the Arugula. Using a wine glass, spoon or spatula compress the tartare just enough to make sure it stays in place. Drizzle the Balsamic Vinegar Glaze over the Salmon Tartare and around the plate. Spoon some of the Dill Cream on top of each tartare and top each with four or five Persian Cucumber batons.